Central Berlin is bristling with police officers. Bemused tourists stop at security cordons to stare at the armoured police vehicles and rooftop snipers around the capital’s luxury Adlon hotel. Germany’s security services are taking no chances with its controversial guest. This will be a stormy state visit. 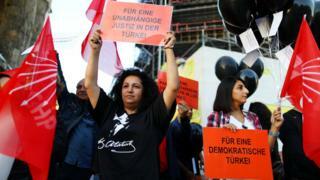 Even before Recep Erdogan’s plane descended – through airspace closed to private aircraft – the protests had begun. Tens of thousands of people are expected to take to the streets during the course of his visit. Reporters without borders were the first to stage a demonstration. Mr Erdogan has infuriated the German government – and enraged many Germans – by locking up journalists and critics of his regime. Among them are five people with German passports. The plight of reporters like Deniz Yucel who was jailed for a year without charge has strained relations between Ankara and Berlin. But Mr Erdogan and his wife stepped down from their plane to a red carpet welcome. He carries with him high ambitions: to reset the Turkish-German relationship and smooth over profound differences of opinion and policy. 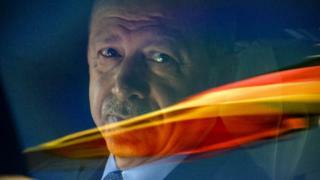 On Thursday morning Mr Erdogan urged Berlin to designate the Fethullah Gulen movement a terror organisation – he blames the group for a coup attempt in 2016. The call, published in a German newspaper, serves to highlight existing tension. Germany has said it needs more proof linking supporters of the US based preacher to the attempt to overthrow Mr Erdogan’s government. Mr Erdogan will also open a new mosque in Cologne, run by the Turkish organisation Ditib. The movement is controversial in Germany, where there are concerns about radicalisation and anti-Semitism in some of its mosques, and the city’s mayor Henriette Reke has already said she will boycott the event. And perhaps it’s rather telling that there isn’t a rush for places at a state banquet due to be held in the Turkish leader’s honour at the presidential palace. Chancellor Angela Merkel won’t be at the dinner hosted by Frank-Walter Steinmeier. Neither will most of her ministers. Mrs Merkel will, however, hold three meetings with Mr Erdogan. Her government is conscious of the huge Turkish diaspora in Germany, which is home to some three million people with Turkish heritage. While he continues to be a controversial figure among the community, two thirds of those who voted remotely in this summer’s Turkish election supported Mr Erdogan. His role in the Middle East, particularly with regard to Syria, matters here too. The conflict will be high on the agenda. Mr Erdogan may be in the weaker position: a struggling economy, exacerbated by a diplomatic fallout with the US, means he is after help and support. Germany is an important trading partner for Turkey but that economic relationship goes both ways. And, of course, the EU’s migrant deal with Turkey, facilitated largely by Mrs Merkel, is still at stake. Under the 2016 agreement, people arriving in Greece to seek asylum are sent back to Turkey in return for billions of euros in aid. Mrs Merkel still views Turkey – and the deal – as playing a vital role in reducing migration into the EU. It is a relationship which matters to Angela Merkel, despite the conflicts. But given her own diminishing power and the contempt in which Mr Erdogan is held here, her welcome will be a cautious one.